Equality and Respect. Nothing less! 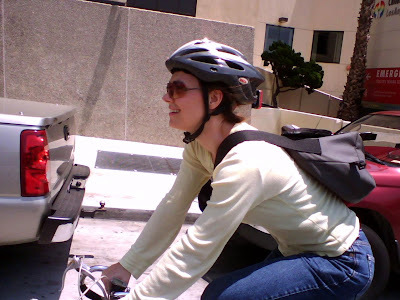 This morning, my wife was riding west on Ventura Boulevard in light traffic. She was in the right half of the #2 lane. She looked over her left shoulder at the approaching traffic and saw an 18 Wheeler in the #1 lane and a Metro Rapid Bus (750) in the #2 lane. They were side-by-side and traveling at the same speed. Enci had parked cars to her right and no room to spare. She held her line, with only inches between her and the parked cars. There were only a few parked cars remaining before the Boulevard opened up and the #2 lane widened. The Bus Operator did not slow down and had no room to move to the left. He passed Enci with inches to spare. Enci had no wiggle room at all. She did not see the Operator but she was able to get the 4-digit number off the Bus. She was shaken, she was pissed and, in an expression of frustration, she yelled at the bus as it drove off down Ventura Boulevard, still side-by-side with the 18-Wheeler. She continued on her journey, westbound on Ventura Boulevard, still in the #2 lane when a motorist passed her and then made a hard right turn (the “right hook”) across her line and into the corner gas station. Enci was able to avoid the vehicle, braking and turning hard left and then right, but ended up losing control of the bike and she hit the ground, hard. As she lay in the street, she was unable to get up off the ground because her left arm and left leg wouldn’t take her weight. No motorists traveling the same direction stopped to help and none of the motorists waiting at the light offered assistance. A pedestrian stepped out to help her get to the curb and to collect her bike. As Enci stood on the curb she looked around the gas station for the motorist who nearly took her out. Moments ago, the motorist was in such a hurry to get to the gas station but after cutting Enci off and leaving her in the street, he had apparently given up on his errand and had left. Enci rested at the gas station, made a few adjustments to her bike and collected her wits. She continued her journey, arriving late to her Theatre Company’s first read of Peter Cottontail, Jr. and then she went home. That was when she lost it. Safely at home it sunk in. She relaxed and the experience caught up with her. The emotion of being terrorized by a Metro Bus Operator and then right-hooked by a motorist and left in the street overwhelmed her and she cried tears of fear, anger, frustration and righteous indignation and utter disappointment in people, people who can threaten someone’s life and then just drive away. As this happened I was in Sylmar, having ridden busted up Lankershim to the debris littered San Fernando Road all the way to the edge of Los Angeles for a breakfast meeting that went long. I called Enci when my meeting ended only to hear her sobbing on the phone. It was a long ride home for me and I felt very helpless. When I walked in the door, Enci was there, no longer crying but now very angry. Before I could address her incident and ask how she was doing, she burst out. Enci was already in activist mode, ready to change the world. It needs changing and there’s no better place to start than right here. We made a few calls. They may or may not have some impact on the Metro. It remains to be seen. The Metro is a large organization with institutionalized behavior and a culture that is stubborn, resistant to change and supported by a strong union. But we won’t give up. LA is a great place to ride and it’s up to us to demand equal access to our streets and it’s up to us to demand respect. Without equality and respect, nothing else matters. Without equality and respect, we will continue to be treated like 2nd class citizens and we will continue to be marginalized. But only if we accept it. As I watched Enci get back on her bike and ride off to her Westside appointment, I stood more committed to fighting for equality and respect for the cyclists of Los Angeles. I hope you’ll join me.